Here in the sun-drenched fields of California’s North Valley, the black soil is rich with promise. In winter, rows of barley seed are laid in the freshly tilled dirt. In spring, trellises are set for hops. From our fields comes a remarkable homegrown ale, made with organic wet hops and barley grown at our brewery here in Chico and one of the few estate-made ales produced anywhere in the world! 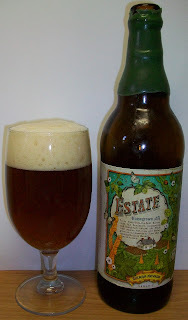 This Estate Ale is rich with the flavors of the valley—featuring hops with earthy, grapefruit-like flavors and layered spicy aromas and barley with mild sweetness and smooth, toasted flavors. Together, these crops grow alongside the brewery to make a truly unique brew. Enjoy! This was a left over from my all Sierra Nevada Thanksgiving Beer Dinner. I feel like I need to apologize up front. I have not done this “Fresh Hop” ale any justice by leaving it in my beer fridge since November. I know the hops will not be as “Fresh” as they were back then. Well, let’s taste it rather then speculating. I guess I also should put out a reminder that I am not a Hop Head but I do enjoy the floral complexity of a Fresh Hop Ale. The beer pours a clear amber with orange hues and a fairly rich off white to tan head. The hop aromas on the nose are wonderful with a great combination of floral and citrus notes. There is also a nice malt background to the nose with sweet caramel notes. Wow, I was right about letting this sit to long. This does not have that great hop bite and complexity that it did back in November. Don’t get me wrong, this is still a great beer but it has aged out of being a fresh hop IPA. It is now more like a regular American IPA but with more of a malt balance. Let me attempt a play by play. The taste starts out with a caramel malt sweetness up front on the tip of the tongue but that only last for a split second. The sweetness is immediately followed by a building hop bitterness throughout the middle of the sip. This bitterness builds until you get to the swallow but it at no point is overwhelming and it dissipates on the back-end. The back-end is fairly easy drinking but there is a good hesitation at the top of the swallow. There is also a different type of hop bitterness that is experience in the back of the jaws during the swallow. The finish has even more and different hop flavors. There is a nice pine bite to the finish but there is also a good malt balance in the finish as well. As I remember this at Thanksgiving there was a crisper hop complexity and a more floral quality to the finish. Now, this is more like an imperial/double IPA but without the high alcohol. There is a long lingering hop bitterness in the final aftertaste of his beer. I’m not sure how that sounded but I am really enjoying this beer. Even though I lost the fresh hop aspect of this beer it is still excellently crafted and highly enjoyable. This would also be a good candidate for cellaring/aging. You will loose the whole purpose of a Fresh Hop ale but you will gain a unique maltier characteristic. I noticed a big difference with just 4 months and those 4 months were in my beer fridge at 40 degrees not a 50 to 60 degree cellar. Well, I’m drinking this one by myself again and the first glass is empty. It is also note worthy to say that this is an Organic beer. The head on the first glass diminished to just a patchy island and a ring around the glass. It also left some impressive lacing. The head on the second class seemed to be creamer than the head poured from the first glass. I am getting toward the bottom of the second glass and we are now at 67.4 degrees. The malt characteristic of this beer becomes even more pronounced as the beer warms and opens up a little. This tastes more and more like an imperial/double rather that a Fresh Hop IPA. All and all this has been a great experience. I was actually looking forward to a Fresh Hop beer but even before I opened this one I was skeptical. This is still a great beer but because of its age it is lacking that Fresh Hop complexity and floral notes. Well there is probably not much more to say about this one. I’ll just continue to nurse that third glass while I work on my conclusion. There are some lessens to be learned here. If you are looking for a Fresh Hop ale you also need to consume it fresh and not let it cellar for 4 months. Than on the other hand if you want to mellow the hop bitterness in an ale like this just cellaring or age it for a while. I saw a significant difference in this one and that was only 4 months in cold 40 degree storage. It should get much maltier after a year or so at 50 to 60 degrees. So my dilemma is in rating this by style. After all I really did not consume a “Fresh Hop” ale. In this case it really does not matter because I would give this experience an A either way. So whether this is consumed fresh or aged for a few months the overall experience is still an A+. I am going to look for this next year and review it fresh just to cover all of my bases. Plus it may be worth reviewing each year anyway. I am convinced that there are subtitle differences in each years hop harvest that effect the outcome of that years “Fresh Hop Ale”.